Options: Choose from either stainless steel or silver metallic powder coat fronts. Choose from Floor Platform (Feet or Casters option), regular flat wall mount system, or slatwall (storeWALL) mount system. See chart below for details. Per Unit: Includes: (1) 6"H x 30"W x 24"D satin black powder coat platform, (4) turned anodized aluminum adjustable legs, (5) black screws, instructions. Use on flat level or slightly sloped floors. One inch adjustment range. 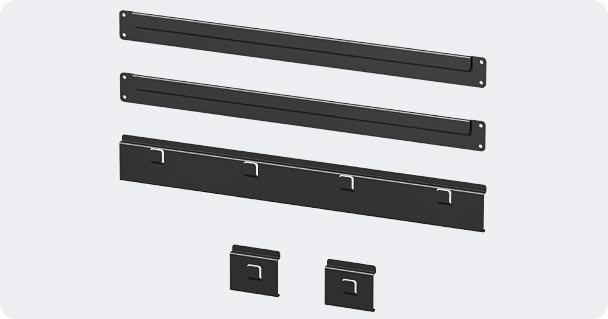 Per Unit Includes: (2) 30"W satin powder coat black j-tracks, (4) 2"W satin powder coat black Z-brackets, (9) black wood screws, instructions. Use on regular flat walls such as drywall, studs, concrete, cinder block, etc. 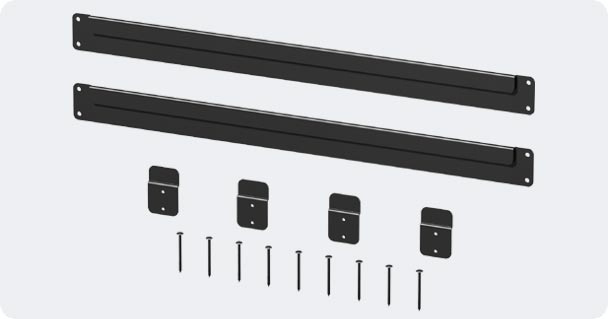 Per Unit: Includes: (2) 30"W satin powder coat black j-tracks, (2) 30"W satin powder coat black channel mount tracks, (9) black wood screws, instructions. Use to mount cabinets on slatwall panels such as our storeWALL Heavy Duty product line. Do Not mount this product on lightweight/flimsy slatwall!!! Per Unit: Includes: (1) 6"H x 30"W x 24"D satin black powder coat platform, (2) locking 500 kilo PU casters, (2) 500 kilo PU casters, (5) black nuts, (5) black washers, instructions. Use on flat level floors. You Will Receive The Proper Number of Units as Shown Above To Mount All Your Cabinets With This Package Per Your Mounting Option Selection. Regular Flat Wall And Slatwall Mount Options Will Not Contain Any Floor Platforms. Includes: Individual units as listed in chart below plus all items above needed per your cabinet mounting option choice. Click on any picture or link below for details on that particular unit. Notes: All cabinet shelves are adjustable in two inch increments from top to bottom of cabinet. Goes up and goes to work in minutes with no bruised knuckles or egos. One Phillips screwdriver and an innovative hinge application make it a simple snap. Hercke brings order to disorder, calm to clutter and style to unexpected spaces. Space-enhancing, home-organizing modular systems that take home storage to new places.